JAXPORT passenger cruise terminal is conveniently located close to Interstates 95 and 10 in northeast Jacksonville, beside the Dames Point Bridge less than 15 minutes from JAX international airport and about 20 minutes from downtown. Book now the best pre and post cruise hotels, motels near JAXPORT Dames Point Cruise Passenger Terminal, disembarkation or embarkation point for Carnival Cruises. Stay nearby, in downtown, at the airport or beach. Jacksonville pre and post cruise hotels near the cruise passenger terminal, at 9810 August Drive fl 32226, include several great value hotels and affordable motels. Many hotels are located close to Jacksonville JAX airport. Several of them offer free shuttles. Stay close to the port, near the airport, in downtown or at the beachfront. 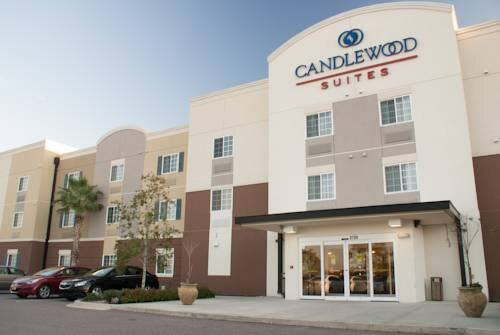 A good number of reasonably priced 3 star hotels and cheaper motels can be found near Jacksonville JAX airport. Some offer special rates which includes free shuttle service to the airport and cruise port. 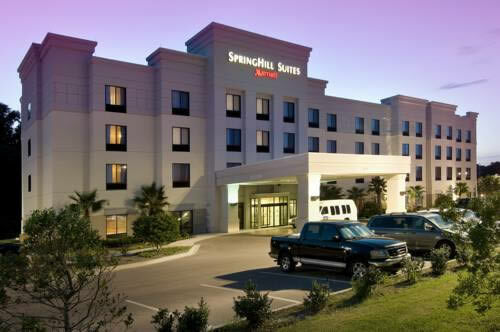 Popular are Jacksonville Plaza Hotel, Best Western Airport and Springhill Suites. JAXPORT is 15 minutes away by car or cab. The airport is located 20 minutes drive from the city centre and many popular attractions. Another option is to stay in downtown on the riverfront, or at the beach. There are many properties to choose from in the downtown area. Some are located adjacent to the St. Johns River. Plenty of shops and dining options can be found within walking distance. The Museum of Science and History is nearby. Cheap property (motel style) located not far from the JAXPORT cruise terminal. Downtown Jacksonvile fl. hotel close to Jacksonville Landing’s shops and restaurants, adjacent to the St. Johns River. Budget friendly hotel located near Jacksonville International Airport. Located in northeastern Florida the area was ruled by the Spanish, French and British during the 16th century. Since the 1880’s it’s a popular tourist destination and became an important trade port in the late 1890’s. Today the Port of Jacksonville is one of the largest seaports in Florida. It’s the northernmost cruise port Florida, a busy container ship port and a primary vehicle import/export center in the United States, operated by the Jacksonville Port Authority (JPA). Carnival Cruises sails from the port to Key West, the Bahama’s (Nassau, Freeport) and the Eastern Caribbean. Dames Point Cruise Passenger Terminal — embark your ship at the JAXPORT cruise facility, situated near the northwest corner of Dames Point, bordered by Heckscher Drive and I-295 in Northeast Jacksonville. Not many hotels are located within really close proximity of the cruise terminal, departure point for many Carnival Cruises. Plenty of hotels and motels can be found a short distance away near the airport or downtown area. Another option is to stay in Jacksonville Beach at a seafront property, on the shores of the Atlantic Ocean. Many properties feature a spacious swimming pool. Downtown is 20 miles away, JAX airport 30 miles, and Adventure landing is a couple minutes drive away. See also Florida’s cruise ports : Port of Miami Hotels, Tampa cruise terminals, hotels near Port Everglades cruise ship terminals (Ft Lauderdale Hotel with Free Shuttle), Palm Beach fl..
Airport — Port of Jacksonville is well served by Jacksonville International Airport, located about 12 miles or 15 minutes from the pier. Taxi and shuttle service is available from JAX to the JAXPORT Cruise Terminal. Parking — safe and secure car parking for cruise passengers is located right next to JAXPORT cruise pier. The terminal building at Dames Point is located at 9810 August Drive, Jacksonville, FL 32226. Parking is $15 per day per passenger vehicle ($60 for a 4-day cruise and $75 for a 5-day cruise), and $25 per day for oversized recreational vehicles ($100 for a 4-day cruise and $125 for a 5-day cruise). JAXPORT provides also designated handicapped parking spaces. 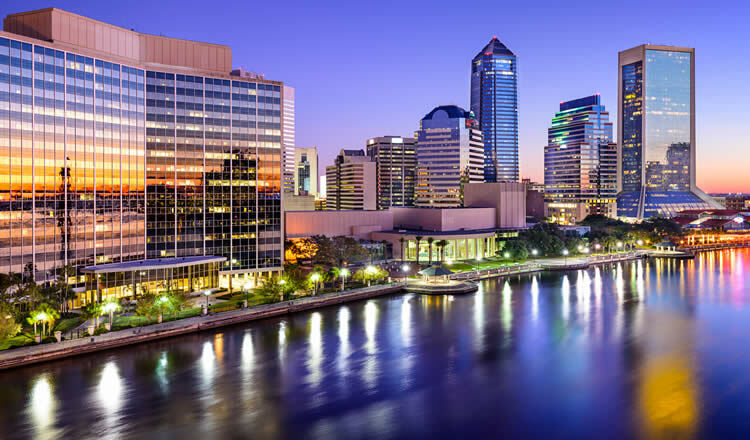 Jacksonville is located at the mouth of the St Johns River, along the Atlantic Ocean in northeast Florida, 160 miles north of Cape Canaveral (Disney’s main cruise port). “The River City by the Sea” offers vast stretches of uncrowded beaches, boatloads of water activities, a fishing pier, great shopping, good food, first class museums, fine hotels and lots of entertainment. Spend a couple nights in a pre cruise hotel or motel in downtown, Jacksonville Beach or near the airport and discover all major sights and attractions. In downtown Jacksonville fl., stroll along the riverfront in Jacksonville Landing, a great spot for shopping and to hangout. Worth a visit for those who like modern art is The Museum of Contemporary Art Jacksonville, also known as MOCA. Oriented towards children is the Museum of Science and History (MOSH), located on the Southbank Riverwalk. It’s the city’s most visited museum with lots of interesting exhibits and hands on learning experiences. At Mayport hop on a St Johns River ferry and head to Fort George Island for a visit to Kingsley Plantation, built in 1798 and Florida’s only existing cotton plantation. The plantation shows the original house as well as the adjacent slave cabins. The city is home to the largest urban park system in the United States, with 10 state and national parks. At the Timucuan Ecological and Historic Preserve you can visit the natural coastal wetlands. Families with kids will love the Jacksonville Zoo and Gardens, known for its collection of rare waterfowl. Not to be missed is the “Range of the Jaguar” exhibit. A very exciting place to take children is North Florida’s longest operating wildlife sanctuary: The Catty Shack Ranch. Get up close to the cages and see the big cats climb the cage during feeding time. Some hotels provide free or discounted parking for the length of your cruise and shuttle services to the cruise port terminal. Most hotels will be next to JAX international airport.